As I write this article we are just emerging from an unusually snowy winter, and it’s hard to believe that spring is just around the corner. But it’s coming. One of the first signs of spring, and maybe Galiano’s favourite, is bright green nettle shoots poking out of the ground. The new leaves are full of calcium, protein, and iron. Perfect to recharge us after our cold winter and get us healthy and ready for spring. 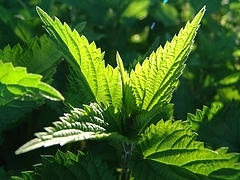 When you are picking nettles for cooking, choose the young and tender leaves, usually the top four or six on a plant. Use scissors to cut the tip and you won’t damage the plant. Nettles are delicious — but most first time nettle eaters are nervous about being stung. Use kitchen or garden gloves when you are picking and in the kitchen until the nettles are processed in some way. Once the fresh nettles are steamed, frozen, dried or cooked the sting is neutralized. There are lots of different ways to use nettles. Some of my favourites are: soup, pizza, nesto, nettle and edamame crostini, and nettle pakora. 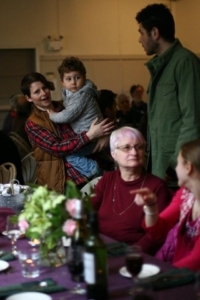 This year the Galiano Community Food Programs 10th Annual Nettlefest weekend runs March 31st to April 2nd. I will be teaching a cooking class on Friday night, Reed and Cedana from the Galiano Conservancy will be leading a foraging walk on Saturday morning, there will be the community nettle pick, and of course the community potluck on the Sunday evening, with the increasingly popular Nettle cooking competition. Check the website for all the details. There’s lots to do, lots of ways to get involved and celebrate spring on Galiano. This recipe is adapted from Madhur Jaffrey’s classic saag paneer recipe in World Vegetarian (2002). I added the non-traditional peas for colour and texture; I also adjusted the spices to suit nettles. Put the milk in a large, heavy saucepan and set over medium-high heat. Meanwhile, place a colander in the sink and line it with a clean dishtowel or three to four layers of cheesecloth. When the milk begins to boil, turn the heat down to low. Quickly add 3 tbsp of the vinegar and stir. The mixture should curdle at this point, the whey completely separating from the curds. If this does not happen, add 1 remaining tbsp of vinegar and repeat the process (and once more again, if needed: make sure the curds are really separated from the whey). Empty the mixture into the lined colander. Add 1 tsp ground, toasted cumin seed to the curds and mix well into the mixture. Let the seasoned cheese sit in the colander for 10 minutes. Gather the ends of the cheesecloth/towel and twist to squeeze out as much water as possible. Wrap the remaining curds tightly, tying off the ends (make sure the curds cohere as much as possible). Lay the cloth and contents on a flat board set in the sink. Flatten the bundle into a patty shape. Put another board on top of the patty. Now put a 5+ lb weight on the patty and press for 5 minutes. The cheese is now ready: it is best used asap (although it will keep in the fridge for a few hours). Cut into small cubes or crumble into large chunks. Set aside. Bring ¼ c water to boil in a large pan. Put in the washed nettle and green chile. Turn heat to medium-low; cover the pan and cook gently for 20 minutes. Mash the nettle with a potato masher until you have a coarse puree. Blend in the cornmeal and cook gently for another 5 minutes, stirring occasionally. In a separate frying pan, heat the oil over medium-high heat. When hot, add the onion and stir and fry until it just starts to brown. Add the ginger and stir, then add the tomatoes and cook over medium-low heat for 10 minutes, until the texture thickens. Stir the tomato mixture into the nettle mixture, then add the salt, toasted cumin, cayenne, and cinnamon, and stir to mix (taste to confirm salt and spices and add more if desired). Cook gently for 5 minutes. Add the peas and cook for 1 minute. Add the cubed/crumbled paneer and stir, very gently, to heat. Serve /asap, with basmati rice or naan. Goes especially well with a simple dal and cucumber raita. The base was blended/crushed almonds, coconut, & pumpkin seeds as well as a gluten free pie crust mix, chopped dates, coconut oil and some honey. 1 T fresh thyme leaves or 1 tsp. dried. 10 ounces fresh nettles, washed, stemmed and coarsely chopped. Make crepes if using homemade and set aside. Heat oil in large skillet until hot enough to sizzle a piece of mushroom. Add the mushrooms all at once and cook, stirring, over medium-high heat until they begin to brown, about 10 minutes. Stir in the parsley, thyme, garlic, salt and pepper Cook for one minute. Reduce heat to medium and stir in the nettles. Cover and cook until just wilted, about 2 minutes. Uncover and add the Parmesan cheese, stirring until melted. Spoon mixture down the centre of each crepe. Roll up crepes and arrange side by side in a 13×9 baking dish. Sprinkle with mozzarella cheese. Sprinkle with thinly sliced green onions and chopped parsley. Cover pan with foil and heat until cheese melts, about 15 minutes. When you are picking nettles for cooking, choose the young, tender leaves, usually the top four or six on a plant. Use scissors to cut the tip and you won’t damage the plant. Nettles are delicious—but most first time nettle eaters are nervous about being stung. Use rubber gloves when you are picking and until the nettles are processed in some way. Once the fresh nettles are steamed, frozen, dried or cooked, the sting is neutralized. There are lots of ways to use nettles. Some of my favourites are: soup, pizza, nesto, nettle and edamame, and in stew. This year I’m working on new recipes for a green nettle ravioli pasta and a nettle pakora. This year’s Nettlefest weekend runs April 15-17. 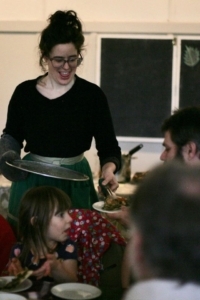 I will be teaching a cooking class on Friday night, Patti and Cedana will be leading a foraging walk on Saturday morning, followed by the community nettle pick, and of course the community potluck on Sunday evening, with the increasingly popular Nettle cooking competition. 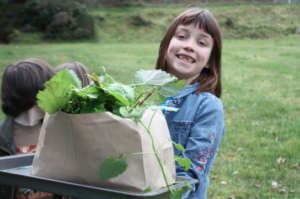 There’s lots to do, and lots of ways to get involved and celebrate spring on Galiano. Are you interested in eating more local food and cooking with wild ingredients? Come spring, stinging nettles are among the first edible plants to burst from the ground in the Gulf Islands. 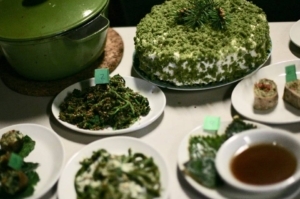 In an intimate setting just an hour’s ferry ride from the Lower Mainland, join us for a fun celebration of local wild abundance on beautiful Galiano Island April 15th-17th, 2016, and learn all about nettles—their health and nutritional properties, how to harvest them, and how to cook them. Come together to celebrate the return of Spring as we gather as a community for the 8th annual Nettlefest Potluck. It’s all about gathering with friends and neighbours, sharing some wonderful food, and enjoying the entertainment of some amazingly-talented locals. Join us, and bring something to share with others. I knew nettles were good for us, but really, how good? To find out, I was inspired to get a lab sample of one of Galiano’s most prominent forageable foods. I then compared the analysis against the nutrient values of kale, broccoli, lettuce, spinach and 2% milk (you’ll see why) and the results blew me away. The data on the foods below came from the USDA Nutrient Database and the Canadian Nutrient File. Most surprising to me was that nettles have the highest calcium content of all these foods. One would have to drink over three times as much milk to get the same quantity of calcium as one portion of nettles. Two other mineral comparisons I thought I’d mention are magnesium and potassium. As you see in the chart below, nettles have relatively high amounts of both minerals. Comparatively, spinach has the highest magnesium and potassium value; and kale also exceeds nettles in potassium value. There were many other interesting comparisons, but the ones above were the main highlights. As we head into an early spring, with nettle growth well underway, I’m going to try to make the most of nettle harvesting, drying and storing. Move over milk and make way for those nettle smoothies!